The concerts of Juventas New Music Ensemble in its winter production (December 17 and 18 at Seully Hall at Boston Conservatory) offered a refreshing change from the Jolly Olde and the Treacly New and the Same-Old-Same-Old to which, it seems, so much Christmas et al. music falls prey. The program’s title, “Winter Solitude,” tips us off that this is not going to be about the holidays as such, but more about the moods of the season, though, truth to tell, not all the music was even about any of that. Also, in keeping with Juventas’s predilection for overlap among art forms, this on (we saw the Friday performance) drew (maybe “shared” is a better term) inspiration from other arts, with interaction between the music and visual and performance art. One set of interactions was obvious from the get-go: the center aisle in the hall was strewn with dried cattails, which added even greater crunch to a crunchy experience. It also added some visual excitement as audience members performed evasive maneuvers to avoid stepping on them — people being too timid to be heard, but obviously heedless of how their contortions made them look. The program opened with the premiere of Oliver Caplan’s Is There a Word That Means Return, for female narrator (in this case the author of the text, Meghan Guidry), bass-baritone (Ulysses Thomas), flute, clarinet, violin, cello, piano and percussion. The text, best thought of as a prose poem, juxtaposes the memories of a daughter for her late father in the context of holiday gatherings, the Christmas tree, the winter outdoors. The setting leaves the daughter’s reveries as spoken text to a tinkly, childlike background, lightly scored except at the one big climax, that does not — and we hope this was intentional — avoid some of the clichés of writing childhood-themed music. The father is represented by conventionally sung music, mostly slow, sometimes gentle, sometimes portentous. After building to a climax the musical materials manage to change places (a nice touch) before receding to their original positions and inflections. Thomas has a fine, honeyed tone and was impressive, although Caplan’s score didn’t move very far in musical or expressive range. Guidry — we don’t know if she is trained at all in theater — spoke her words, for the most part, as if still a child. She even managed to turn her ankles inward, the way a little girl does, and raced through the words breathlessly (and not always intelligibly, if you weren’t following in the program); this is not how one would imagine them done just from reading them on the page. Sometimes the author is not a work’s best interpreter. The ensemble, conducted by Lidiya Yankovskaya, consisted of Zachary Jay, flute; TunMan Ho, clarinet; Yohanon Chendler, violin; Rachel Arnold, cello; Julia Scott Carey, piano; and Brian Calhoon, percussion. We could find no fault with the performance, and the sonic balance among instruments and between the instruments and the vocalists was excellent. There followed from the Caplan another premiere, of a work by Erin Huelskamp entitled Fractal Space. This the first of two pieces on the program to derive inspiration from a series of fractal paintings by Nicholas Shaplyko and Ekaterina Sorokina, which were not available on Friday but were to be displayed at the Saturday performance. (Note: alert readers who happened to attend the Saturday performances are encouraged to post comments on how they thought this work and the Rudolf Rojahn piece responded to what they saw.) Huelskamp, who has recently been heavily involved in theatrical projects, often lets her musical work take on dramatic coloration. In this case, there was a bit of stage play involving having the musicians (Ho on bass clarinet, Ashleigh Gordon, viola, and Calhoon on glockenspiel and tenor drum) process slowly to the stage, accompanied by “mystery stagehands,” mummer types wearing Batman face masks, and by giving the musicians some pregnant and statuesque body language to accompany pauses in the music. The music begins with a protean figure in the bass clarinet, which is commented on (fractally, we suppose) by the glockenspiel and developed briefly by the viola. What there was sounded attractive, but the piece was over almost as soon as it had begun. It’s a good thing to keep the audience wanting more, but this time the lack of further development to motives that seem to cry out for it gave the appearance of music not fully cooked. The first half concluded with another work that incorporated theatrical elements, Elliott Bark’s Winter Sketches, a 2008 piece that is basically a string quartet, in four movements, bearing the titles “…snow…falling…blurred,” “Dark White,” “Resounding Prayers in Empty Hearts” (having to do, the composer’s note tells us, with people threatened by cold weather), and “Childhood Mosaic.” We aren’t sure whether this piece was designed to be accompanied by performance art, but on this occasion Joe Joe Orangias and Jessica Borusky created a visual counterpoint to the music. Borusky began at —more properly, on — the floor below stage center, first seated and then stretched out on the cattails, and as the music progressed she slid backwards, mostly prone, gathering up the reeds, all the while she was bathed in the light of Orangias’s video of bare woods and fields. Sometimes she paused, to gesture or reflect, and her pace more or less tracked that of the music. Maybe it’s just a function of our senescence that made us find the movement art superfluous; and we’re not enough of a balletomane to comment on the artists’ standalone merits. As to the purely musical elements, we found Bark’s quartet, performed by Chendler and Olga Patramanska, violins, Gordon, and Arnold, full of intriguing ideas and solid technique. We were especially impressed by the last movement, where disjointed fragments gradually work their way together. The musical idiom was non-tonal in the first two movements (lovely accompaniment in harmonics to a viola melody in the first movement, energetic and snarly outbursts in the second), giving way to a melancholy tonal slow movement somewhat in the spirit of Barber’s Adagio, The finale was a kind of summation, with enough confidence to end with an actual cadence to a tonic note. We’d be happy to get better acquainted with this piece. During the intermission more visual art entered the room, as the sculpture by Charlotte McFarland that was to accompany Eleanor Aversa’s Something Gleamed Like Electrum was set in place. 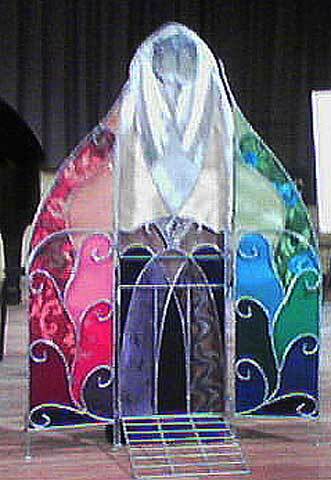 It is a triptych in the shape of a Gothic stained-glass window (the panels are opaque, cloth and possibly painted materials), on a metal folding frame, with interstitial boundaries like the lead between glass sheets of a real window. Aversa’s work derives its title from a passage in Ezekiel, so it was perhaps natural that, what McFarland described as cloud and sky and abstract colored patches reflecting the qualities of the instrumental effects, we took to represent the head, beard and raiment of an Old Testament prophet. What Aversa has written is a very attractive chamber tone poem in the old Lisztian or Straussian sense. Her melodic materials are clearly defined, her harmonic idiom is neo-Romantic with whole-tone coloration, and her developmental craft is solid, with a strong dramatic sensibility. Our only criticism is that, like the Huelskamp though not as starkly so, Aversa has not given her materials enough breathing room to develop their potential. The ensemble, comprising Jay, Ho and Chendler and Carey and Arnold, played lushly and well under the baton of Ian Garvie. Rudolf Rojahn could not have had a more different approach to the Shaplyko-Sorokina paintings from that of Huelskamp. His “penelope fragments,” also receiving its premiere, embodied a more process-based response to the paintings in the series by assembling ten short movements, each consisting of forty “syllables” (we’re not sure what that means in musical terms) and setting ten snippets from the “penelope” sections of James Joyce’s Ulysses, which contain exactly forty syllables. The singer (here, Chelsea Beatty, soprano, who has a good tone and powerful projection) is asked to assign these fragments randomly to the movements, which otherwise involve vocalise-style wordless singing. An interesting idea, with one catch: the fragments were selected to illustrate the parallel intensification and unwinding of two sexual relationships, and the randomization makes it even less clear than Joyce’s prose exactly how all that is working out. It also means that the music, some of which is conventionally played and sung, some of which requires some extended technique, and a stammering sort of neo-Monteverdian repetition, doesn’t really set the text, beyond the manufactured syllabic correspondence. Beatty’s delivery, too, which was studied in its neutrality, gave little hint of the steamy subject matter. Some of Rojahn’s musical effects were striking, but the overall approach owed too much to the mechanistic anti-textual ethos of postwar Europe to make much affective sense in the here and now. The instrumental ensemble for this work, doing a fine job, as it did for the whole evening, was a string trio comprising Chendler and Gordon and Arnold. Yankovskaya conducted ably. The concluding work was Passacaglia Zero for clarinet, string trio and piano four hands by Polina Nazaykinskaya (do we detect a Russian flavor to the evening? ), who at twenty-three was the youngest composer on the bill, the oldest being all of thirty-one. The composer’s note dwelt extensively on the form and structure of the piece, a combination of passacaglia-variation form on an unvarying melodic pattern “fitted up,” as Virgil Thomson said of his Symphony on a Hymn Tune, as a sonata-rondo movement. We are pleased to report that this sounded more engaging than its description would lead one to believe.” Notably, the four hands of the pianists Carey and Garvie were occupied not only on the keyboard but in producing some wonderfully rumbly percussive sounds directly on the strings. There were detectable elements of Shostakovich in the sound and rhythms of the second subject, and eventually also in the two-octave spacing of a racing piano line. The performance by the ensemble of Ho, Chendler, Gordon, Arnold, Carey, and Garvie, led by Yankovskaya, was lively, engaged, and well balanced. The visual-arts element of the performance consisted of painter Rachel Jackson’s creating a work onstage as the music unfolded. Ms. Jackson was plainly not to be taken as one of the performers. She took no cues from the conductor or the other players; rather, she stood in for us, the audience, reacting in brushstrokes to what she heard. What came out looked vaguely tree-like, but that was less significant than the process. Curiously, Jackson’s color palette was more restrained than the sonic “colors” in Nazaykinskaya’s score. It ought to be disclosed the author Vance Koven is also the lawyer for Juventas New Music Ensemble, the subject of the review. Writing reviews of the Juventas’ performances is a huge violation of both journalistic standards and professional conduct as a lawyer. The inclusion of negative comments does not fix the conflict of interest, and certain Juventas members with whom he has worked closely are routinely spared from his harsh critiques. I’m not sure what professional ethics Mr/Ms Anonymous is thinking of, but the Massachusetts Code of Professional Conduct would recognize no conflict of interest between myself and Juventas; in fact, it would be quite the opposite, more like an identity of interest. And, since I don’t represent BMInt there’s no conflict of interest with them (nor would there be even if I did represent them). Although I have performed legal services for Juventas in the past, I have no ongoing interest in the organization, nor am I on its board, so I feel quite free to exercise my critical judgment about their performances, which of course have nothing to do with their legal status. As to journalistic standards, let’s get real: Boston is a pretty small place, and the classical music scene abounds in friendships, personal rivalries, and all the other ills that flesh and mind are heir to. Our view here is that so long as there is no institutional connection between reviewer and organization, or close personal affiliation, the reviewers are free to cover events despite knowing, or even being friends or enemies of, the people involved. I do not, for example, cover Dinosaur Annex concerts, on whose board I sit, or cover performances by my wife, who is a professional musician. If anyone is interested, I spoke passingly to this theme in an article I wrote earlier this year, https://classical-scene.com/2010/06/28/thanks/ , which went into some other aspects of the ethics and etiquette of reviewing. There was therefore no lack of disclosure of my position, at least. As to those “harsh critiques” from which Juventas personnel have obtained, according to Anonymous, exemption if not a plenary indulgence, I’m unaware of what they might be, since I don’t routinely, or for that matter very often at all, dish out harsh critiques of anyone–and certainly none where I haven’t explained their basis.